I love one pot meals. I think that is one of the reasons why I like skillets so much. Easy and minimal clean up. Those are my type of dinners and this meal was beyond good! A keeper for sure! Cut potatoes into cubes and boil until soft. In a large skillet, season chicken with cajun seasoning. Cook chicken until brown on both sides and no longer pink inside. Remove from heat and cut into cubes. In the same skillet, heat olive oil and add the onions and peppers. Saute until soft. Add potatoes to the pepper/onion mix and cook for another 3-5 minutes. Add the chicken, bacon, and cheese. 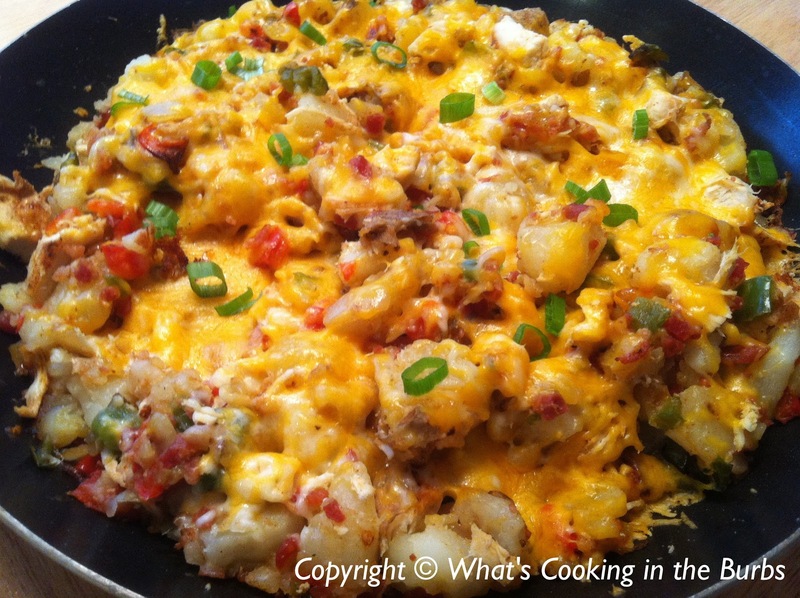 Cover the skillet with a lid and remove when cheese is melted. Oh my word! This looks delicious. I'm going to pin it now so I can try it out later in the week. Thanks for sharing! This looks so good. I love skillets! Nothing better than a one-pot dish! Thank you, I have pinned this ;-) Thank you also for sharing this delicious recipe at the ALL MY BLOGGY FRIENDS party! Delicious, so glad I found your blog! Oh I am all over this meal! Thanks for sharing on Show Me Your Plaid Monday's! Oh wow does that look good! Pinning to try very soon! Thank you....this is just what my menu plan needed! Can't wait to try on my tribe of hungry teens! YUM! YUM! YUM! This is actually 11 points plus. Please don't false advertise. People like me that are trying hard to stick to weight watchers would over indulge using the 49 extra week points. I'm sorry you think that. All my recipes are calculated through My Fitness Pal and are accurate. I was also on ww in the past (actually while I created this recipe) and know how important it is to stay within your daily points. Good Luck on your weight loss journey! I entered the points on W.W. and I came up with 6! For 6 points of YUM I'm all in! Thanks for a great recipe!